The HealthWorks! Kids’ Museum in St. Louis, Mo. The educational play exhibit at the HealthWorks! Kids’ Museum in St. Louis, Mo., let’s kids learn about, among other things, areas of the brain and their functions through an interactive LED panel. 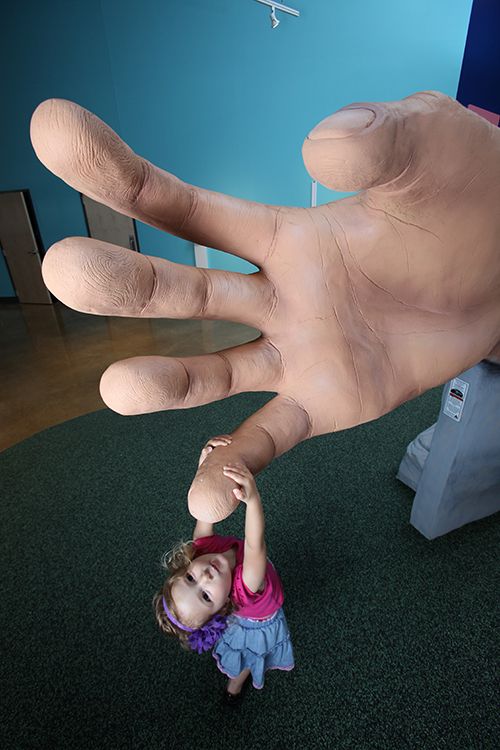 The leg of the giant body (right) is a slide; kids are encouraged to interact with the body. The HealthWorks! Kids’ Museum in St. Louis, Mo., opened May 14, 2016. Its mission is to educate youngsters about the importance of oral heath. The museum, located on Macklind Avenue near Forest Park, used to be the Delta Dental Health Theatre, whose main attraction was “the world’s largest set of fiberglass teeth,” which remains as one of the new museum’s attractions, hanging from the ceiling as a gigantic toothbrush moves across the teeth. The brushing creates bubbles that fall down on those observing the teeth cleaning. The HealthWorks! 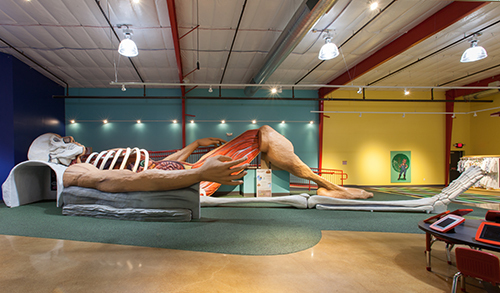 Kids’ Museum’s main piece, however, is the 55-foot long, 25-foot wide, 8-foot tall human skeletal structure that serves as a universally accessible indoor playground. The entire play space was designed and built by Cre8Play (www.cre8play.com), working in conjunction with Cunningham Recreation (www.cunninghamrec.com). Unlimited Play (www.unlimitedplay.org) consulted on ADA accessibility. The Interactive Dude was funded through a grant awarded to Unlimited Play by the St. Louis Office for Developmental Disabilities (DD Resources). DD Resources serves St. Louis residents diagnosed with autism spectrum disorder, cerebral palsy, epilepsy and intellectual disability. 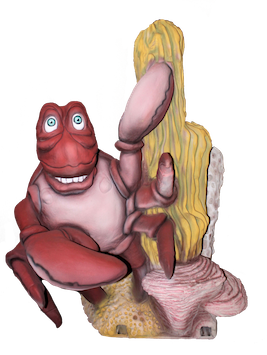 Cre8Play refers to the unusual play and learning structure as “Dexter,” while the museum refers to it as the “Interactive Dude.” The Dude features a leg slide, a bone balance beam and the ability to explore under the rib cage and climb on it. Children can also play an electronic, memory-style healthy eating game attached to the digestive tract. One can walk inside the skull and learn about the frontal, parietal, temporal and occipital lobes, the cerebellum and the brainstem. There are also informative displays about heart health and the harms of smoking. 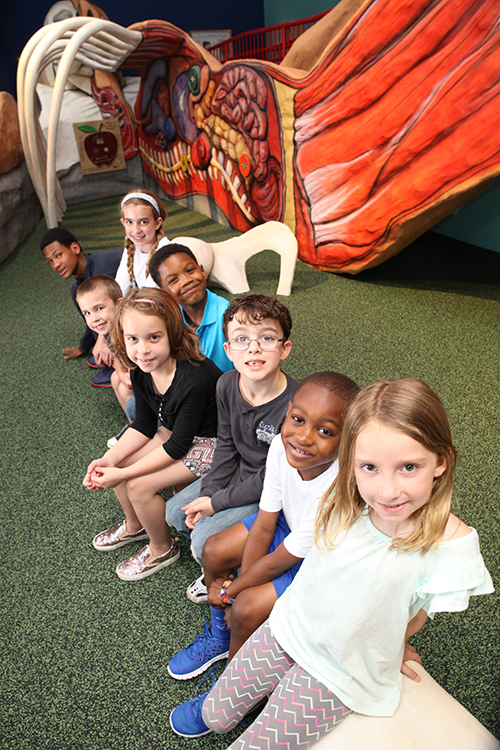 Kids can play a game of active “Simon Says,” while learning about the larynx. There’s even education about that most basic but embarrassing human biological function that is usually avoided: pooping. The “all-bout poop” panel includes a passing gas sound effect, which, as we all know, never ceases to entertain kids and adults alike. The designers say the exhibit really “spills the guts” on the human body from head to toe, offering up unique lessons to young, impressionable minds. St. Louis is near the bottom in several pediatric rankings, including asthma, diabetes and obesity. Anonymous surveys for museum visitors will be used to collect data about local kids’ dietary and exercise habits. and in Landscape Architect and Specifier News magazine.